Master Xehanort is first seen in his youth, as a young man living on Destiny Islands with a dream to leave his home and find something greater. Eventually he was able to make this escape a reality and was trained as a Keyblade Master, befriending Master Eraqus. During his many travels, Xehanort amassed great power and knowledge, being well-versed in topics concerning the Keyblade, Kingdom Hearts, Light, Darkness, and most importantly to him - the Keyblade War. First learning of Kingdom Hearts - the heart of all worlds - Master Xehanort realised the great power that could be wielded by someone who could open a way to the mythical place. It was in his quest to gain this entrance that Master Xehanort learned of the χ-blade: a legendary weapon capable of unlocking Kingdom Hearts, and over which the Keyblade war was fought. Master Eraqus saw the danger in these pursuits, and when Xehanort discussed it with him he was met with staunch opposition, to the point where the disagreement escalated to physical violence, ending in Xehanort overpowering Eraqus and using his dark powers to scar Eraqus' face. Much later, Master Xehanort adopts Ven as his apprentice, seeking to eventually use his as a new vessel, Xehanort's body having grown old. 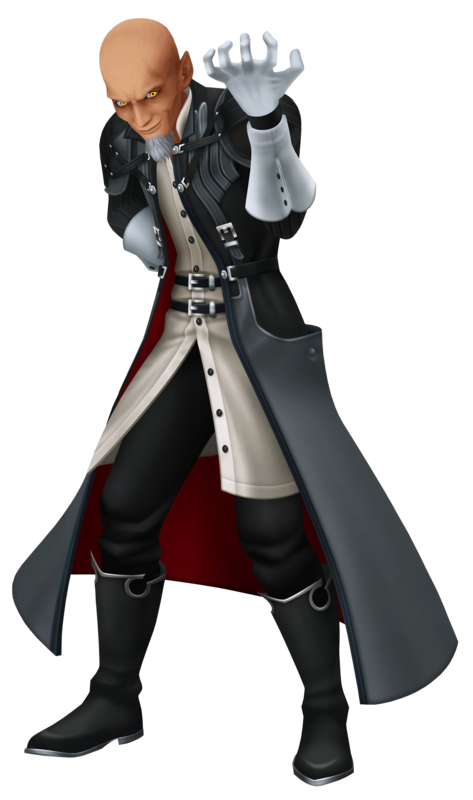 Ven - though unwitting of this part of Xehanort's plot - still proved to be a poor candidate, unwilling to use his darkness to fight off a few powerful heartless. Instead of do away with Ven totally, Xehanort decided to repurpose the boy in the scheme of things: He used his Keyblade to unlock Ven's heart and extract all the darkness from it, shattering Ven's heart and putting him into a coma while giving rise to the being Xehanort would name Vanitas. Xehanort then takes the comatose Ven to Destiny Islands where he may live out his fading existence at peace in a beautiful place. As Xehanort prepares to leave, Ven's heart connects with that of a very young Sora and Ven reawakens, shooting a beam of light into the sky with his keyblade, prompting Xehanort to once more find a use for Ven: he takes him to be the apprentice of Master Eraqus, who will train him to be strong and foster the light within him, a light that needs to be balanced with the darkness in Vanitas in order to create the χ-blade. It is as he is delivering Ven to Eraqus that Xehanort makes note of Terra and the darkness in him, setting his eyes on Terra to be his new vessel, after some cultivating of his darkness. Four years on, it is the day of the Mark of Mastery exam, the proceedings of which Master Xehanort has covertly tampered with to cause Terra to fail, placing him in an ideal situation to be manipulated by Xehanort. Later on in the day after Terra's failure, the young man is approached by Xehanort, who tells him that the darkness within him is not something to be feared, but embraced. He goes on to inform Terra of an inherent flaw in Eraqus' beliefs: it is impossible to destroy darkness, the most that can be done to it is to redirect it, and that a true Keyblade Master would be fearless in the face of darkness and bend it to his will. Shortly after this, Xehanort and Vanitas depart suddenly on what appears to be a quest for the Princesses of Heart - beings with no darkness in their being. On his subsequent journeys, Xehanort manipulates Eraqus' apprentices to all tend towards his ultimate plan, while also convincing the witch Maleficent to capture the seven Princesses of Heart as a fail-safe, should the forging of the χ-blade be rendered an impossibility. He pays particular attention to Terra, taking every opportunity to sow seeds of doubt for his friends in him, as well as foster the growing darkness that resides within. In Radiant Garden he has Braig apparently capture him, promising he will be rewarded with his own Keyblade, so that in the subsequent fight Terra can give into his darkness to defeat the gunslinger. After Terra's victory, Xehanort further cements his own position in Terra's eyes, acknowledging his long-held dream by specifically calling him ‘Master Terra'. Later, Xehanort has Vanitas abduct Mickey to draw Ven to the Keyblade Graveyard, where he reveals to Ven the entirety of his past, and the sinister role he must continue to play as events continue to unfold. Before ejecting Ven and Mickey from the world, Xehanort tells the boy that Eraqus knows more, doing so with the intent that Eraqus will also learn the whole truth and attempt to destroy Ven to prevent the creation of the χ-blade. Master Xehanort's skills of manipulation are put to their most sinister use when he calls Terra to the Keyblade Graveyard and tells him that Ven has learnt of his past, and is going to Eraqus for answers. However, Eraqus, fearing the darkness and everything about Xehanort, will likely eliminate Ven. Acting to save his friend - though also acting on grossly twisted fraction of the truth - Terra rushes to the Land of Departure, sending Ven to safety before wounding Eraqus. At the conclusion of their battle, when they both begin to regret their actions, Master Xehanort arrives and strikes down Eraqus, then telling Terra to head for the Keyblade Graveyard. Master Xehanort and Vanitas are confronted in there by Terra, Aqua and Ven, to which Xehanort reveals the entirety of his plan to create the χ-blade, unlock Kingdom Hearts with it and bring about a second Keyblade War. As Terra ascends raised cliffs to assault Xehanort, the old master commands Vanitas to kill Aqua and overpower Ven, the latter of whom launches a failed sneak attack on Xehanort, and winds up frozen, only to the nbe dropped off a cliff, but luckily caught by Aqua. At this point, Terra approaches Xehanort, brimming with rage and on the verge of losing total control of his darkness. Terra tries to stop Vanitas as he fights Aqua, but is stopped by Xehanort, who revels in ‘apprentice's apparent weakness, saying he'll need to use his darkness to truly fight him, and it is at this stage the Terra moves beyond the precipice, losing total control of his darkness. Immensely pleased, Master Xehanort thrusts his own Keyblade into his chest, unlocking his heart, which forces its way into Terra's body, ejecting his mind which goes on to inhabit his armour. The animated armour then goes on to fight the Terra-Xehanort hybrid, and is able to knock him unconscious, after which the explosive destruction of the χ-blade sends Terra-Xehanort to Radiant Garden. There, he remains unconscious until Aqua arrives, who is unable to bring out any trace of Terra's personality, going on to fight the confused and agitated hybrid. As Aqua claims her victory, the inner struggle for control between Terra and Xehanort escalates to the point where Xehanort exerts his last act of control: plunging his Keyblade into his chest to unlock his heart once more, trying to force Terra out entirely. This action, however, wipes Terra-Xehanort's memories and leaves him in a greatly weakened state, doomed to sink into the Realm of Darkness, were it not for Aqua's sacrificial intervention. The next day, Ansem the Wise and his apprentices arrive to discover Terra-Xehanort's body and Aqua's Keyblade and armour. When asked his name, the amnesic man responds with the only name he remembers: Xehanort. As the new Xehanort continues onward in the Realm of Light, it appears that even with Terra's struggling rebellion, it may only have gone according to plan. With Braig aiding him on the outside and his many roads still remaining, it can only certain that this will unveil a great deal of hidden truths in the near future. Originally hailing from the Destiny Islands, Master Xehanort yearned for the outside worlds, unsatisfied with the life the islands offered him as he was imprisoned by the vast seas. As he gazed upon the horizon one day, he was met by a man in a brown cloak, who revealed himself to be his future self, where he instructed him to seek out the Keyblade, become a Master and set the events in motion for what lies ahead. He studied alongside Master Eraqus in the Land of Departure and inevitably caused both his and the world's demise, as well as that of Eraqus' precious students. Xehanort is obsessed with the Keyblade War and longs to create a world where light and darkness are equal, but a world of peace and equilibrium is far from what he has in mind. Through Master Xehanort's extensive planning, he arranged for his past selves to gather in The World That Never Was to welcome him back as he returns a complete person. Riku and Mickey tried valiantly to prevent that from happening, but their efforts proved futile. He told them of the Keyblade War, how the original battle destroyed the χ-blade and caused it to separate into 20 pieces; 7 of light and 13 of darkness, and scattered itself throughout the worlds, and of the events that took place over 10 years ago, when he attempted to forge the χ-blade by forcing a heart of pure light and a heart of pure darkness to clash. However, that plan failed, and he realized that there was but one way to achieve his goal. When Mickey accused him of destroying the lives of his three friends, Xehanort merely replied that it was all according to destiny; he merely guided them on their way, same as he did with Maleficent. He placed key pieces on the path for each pawn, but it was their choice to continue walking. Xehanort had gathered all 13 of his seekers of darkness, but that left the guardians of light short. All that he has left to do was fill Sora, the final seeker, with his heart and mind, and they'll be completed. However, before he could do so, Lea burst in to rescue Sora from his terrible fate. Xehanort seemed to have expected that, and instructed another seeker to attack him. To Lea's complete disbelief, it was none other than Saïx, long since abandoned his former name and life. With the time run out on their gathering, the 12 Xehanorts had no choice but to return back to their own times.